By Emily Auerbach Feature Correspondent. Sitting at desks has been our dominant model for learning in schools. The standard school desk is uncomfortable and hard. The new creation of the standing desk has caught the attention of staff and students across the country and some states have already incorporated them into their classrooms. The standing desk is an innovative new way of learning says Dr. Mark Benden of Texas A&M. “When schools tell children to sit still and be quiet, you’ve almost wounded them. They want to be wiggling and fidgeting and moving,” he said. 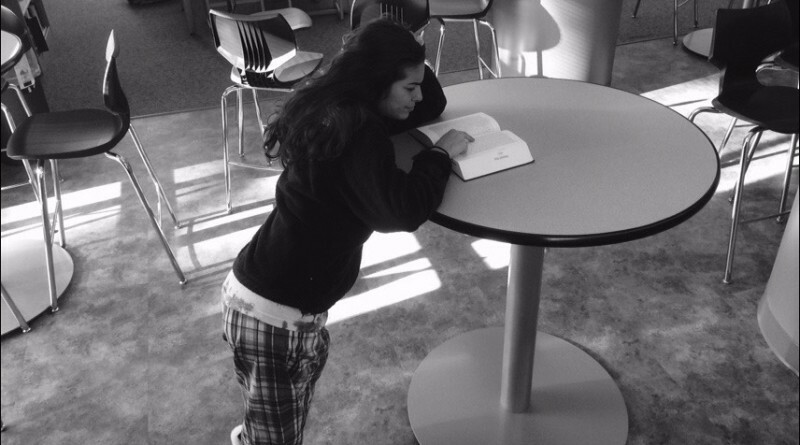 “I think standing desks are a great idea,” says senior Zoe Federman. Ms. Collins says that students generally spend too much time sitting during the school day so the concept of the standing desk is a good idea. “It would encourage students to have better posture and more energy. I think that it is just better to stand and to move around during the day,” said Collins. Juliett Starret and the crew of “Standup Kids”, an organization fighting for children’s health, claims that normal weight kids who use standing desks at school burn between fifteen and twenty five percent more calories than a student working at a standard desk would. And kids that suffer with obesity burn between twenty-five and thirty five percent more calories. “It is rare to find children rolling down hills, climbing trees, and spinning in circles just for fun. Merry-go-rounds and teeter-totters are a things of the past,” Pediatric occupational therapist Angela Hanscom said. Starret also says that the average U.S. student is sitting at school on average of four and a half hours a day. And for people from the ages of eight to eighteen there is an additional seven hours a day that is spent sitting in front of a screen, regardless of socioeconomic status. Combine sitting at school in front of a screen with driving to school, doing homework, and eating meals, kids are sitting eighty-five percent of their walking hours. “As a trained yoga instructor, I am always trying to get students up and moving so I think that incorporating the standing desk into students everyday school like would be very beneficial to their health,” added Ms. Collins. Junior Julia Weiss is in favor of incorporating the standing desks into the school system. “I think that by having the opportunity to stand up while working will get the students brains to focus more. I get tired from sitting all day at school and having to deal with my legs going numb,” she said. While Weiss agrees that the standing desks will benefit the students, senior Sonny Somdah disagrees. “I do not believe that by adopting the standing desk into the school system that the school will improve the students learning habits,” said Somdah. Regardless of why the standing desk invention should not be incorporated into classrooms, the President of the United States is seeking up to $700,000 worth of funding for the project, but it will ultimately be up to the students and the school budgets.